The second in a new series of commissions for Brixton Underground station, Art on the Underground present a large-scale public artwork by Mexican-born and New York-based artist Aliza Nisenbaum, launching on 10 April 2019 and on view until 16 September 2019. The work is the first public UK commission by Nisenbaum who has used the Brixton murals from the 1980s as inspiration. As we approach the prospect of the UK leaving the European Union, a defining moment for the UK against a backdrop of worldwide geopolitical change, this new commission forms part of Art on the Underground’s 2019 programme which looks at the role artists can play in drawing out ideas of future utopias of togetherness and belonging. Influenced by the Mexican mural movement and its depiction of social history, Nisenbaum’s work probes the politics of representation by bringing overlooked groups of people together in exquisitely painted portraits. She continues this practice for her new commission where she has been artist-in-residence, living and working in Brixton for three months. 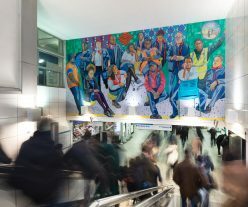 Through an open call, Nisenbaum has selected 15 people working on the Transport for London network across the Victoria line – including train drivers, operational staff, to those working in facilities and administration – who over several hours, were individually painted in her studio to create a large-scale group portrait specifically for the entrance of Brixton Underground station. For the fifth edition of the pocket Night Tube map commission series, British artist Jade Montserrat, has created a pencil and watercolour work on paper. The work draws on the artist’s long-standing text-based series, examining individual experiences of structural racism in Britain, shaping our understanding and experience of the world we live in. The map will be accompanied by a poster work titled ‘”My anger became my motivation”: Baroness Lawrence on Grenfell’, displayed in the 270 London Underground stations and a limited edition print, ‘In memory of Sarah Reed’. Both titles directly reference current incidents of exploitation in the UK. Murals are indicators of both place and time. During the 1970s and 80s, London became an important centre for mural production. Murals from this period represent the political climate, social context and communities who collaboratively made them. These qualities define the murals that populate Brixton today. However, as London is further developed, many murals are being damaged or destroyed. The surviving murals reveal the rapid change London has undergone in the past few decades, but they have not received the same recognition, protection and conservation as other public artworks or heritage sites in the city. 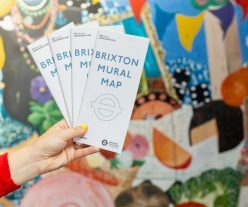 This Mural Map shares the stories behind Brixton’s murals and makes these overlooked public artworks more visible. From 2018-20 Art on the Underground has commissioned contemporary artists to create new artworks in response to the Brixton murals. These works explore commemoration, collective memory and the wider history of mural making, and will be on display at the Brixton Underground station entrance. 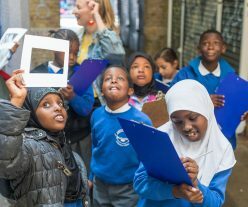 As part of this programme Art on the Underground has worked with artist Meera Chauda and six local primary schools to create artworks inspired by the Brixton murals. Each school has designed their own artwork, using drawing and collage, in response to the themes in the original murals. The schools visited specific murals which influenced them to think about what they wanted to celebrate and commemorate about their local area. The designs on display show the pupils’ responses, they are created from tessellated shapes, reminiscent of the London Underground tiles, which reflect each school’s symbol and colours. 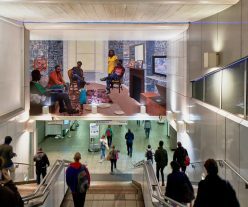 Art on the Underground present a new commission by Njideka Akunyili Crosby for Brixton station, which will be on view for six months from 20 September. Nigerian-born Akunyili Crosby has been invited to take on the first commission in a new programme at Brixton station. The programme takes the numerous murals that were created in Brixton during the 1980s as an initial point of departure and invites selected artists to respond to their diverse narratives, the rapid development of the area and the wider social and political history of mural making. Akunyili Crosby’s work explores her hybrid cultural identity, combining strong attachments to the country of her birth and her current home in Los Angeles. This theme will continue in her new Brixton commission, this time addressing a specifically black British perspective. Akunyili Crosby has created a work that investigates shared cultural memory and connects the past and present through an exploration of place. Remain, Thriving is a new work made specifically for the entrance of Brixton Underground station. The work depicts an imagined domestic scene, a theme predominant in much of the artist’s work, of an informal gathering of grandchildren and great grandchildren of the Windrush generation in a fictional home in Brixton. The space contains a number of vestiges of an earlier generation, such as a doily or record player, which the figures might have inherited from their parents or grandparents. In order to anchor her new work in Brixton, and a British diasporic experience, Akunyili Crosby spent time in the area speaking to longstanding members of the local community as well as public historian Kelly Foster, the Black Cultural Archives, and the Lambeth Archives. The artist collated contemporary and archival images of Brixton to use in her final artwork, and the transferred images in the background of Remain, Thriving echo the heavily patterned wallpaper of a previous era. Through the use of photo-collage, Akunyili Crosby’s layered images of social gatherings are also complex reflections on history, community and politics, much like the original Brixton murals. The artist creates densely layered figurative compositions that, precise in style, conjure the complexity of contemporary experience. Art on the Underground present a major public commission by British artist Linder at Southwark station, on view until October 2019. 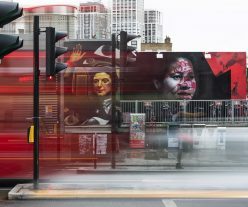 The work, the first large-scale public commission by Linder in London, consists of an 85 metre long street-level billboard at Southwark station and a cover commission for the 29th edition of the pocket Tube map. Linder has spent four months as artist-in-residence, carefully researching and mapping a vertical history of Southwark. The artist’s starting point begins in the belly of the architecture at Southwark station. Designed by Richard McCormack and opened in 1999, the station was inspired in part by the 18th Century notion of the English landscape garden and sought to create a place of peace and tranquility, a refuge from urban life. Further research draws on local collections including Southwark Council’s Cuming Museum Collection, the London Transport Museum Collection, and Transport for London’s lost property office as source material for an ambitious photomontage that will wrap the entire station façade at Southwark station. London-based Phillipson works in video, sculpture, online media, music, drawing, poetry and what she calls walk-in collages. Relationships between human and non-human animals are a recurring theme in her work and for this commission she focusses on the egg as an object of reproduction, subject to human interference. 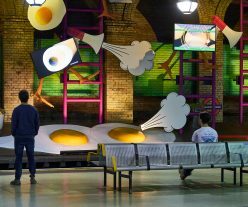 In her space-filling sculptural and video installation for Gloucester Road’s disused platform, Phillipson will use video game-style layout techniques to magnify eggs and avian body-parts to monstrous proportions. Eduardo Paolozzi’s mosaics at Tottenham Court Road are one of the most spectacular examples of public art in London. Completed in 1986, the glass mosaics cover 950 sq metres featuring prominently on the Northern line and Central line platforms and an array of interconnecting spaces. The mosaics reflect Paolozzi’s interpretation of the local area and his wider interest in mechanisation, urbanisation, popular culture and everyday life. As part of a major renovation of the station, the mosaics have undergone significant restoration and conservation work. Around 95 percent of the mosaics have been retained at the station while it underwent a huge expansion to prepare for the introduction of the Elizabeth line and meet the needs of London’s growing population. Restoration and repair work has taken place on the Northern and Central line platforms, and in the Rotunda. One of the final and most complex aspects of the project was the relocation of the striking mosaic panel from the former Oxford Street entrance. Following intensive planning and consultation with conservation experts, the artwork was carefully removed from the wall in one piece and lowered down a lift shaft to begin its new life at platform level. Sections of the arches that could not be relocated within the station were transported to the world-renowned Edinburgh College of Art, based in the city where Eduardo Paolozzi studied in 1943 and later became a visiting professor. 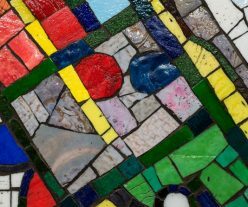 They are currently being used in teaching a new undergraduate programme, ‘Edinburgh Collections’, and the University is consulting with specialists over how best to reconstruct the mosaics into a new piece of public art. To find out more about the restoration project, watch our documentary below. Clay Station is a collaboration between Assemble and the artist Matthew Raw commissioned by Art on the Underground. 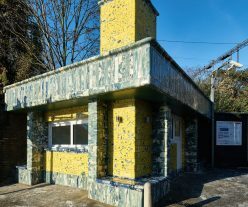 Building on London Underground’s rich heritage of ceramics, the project involves the production of more than a thousand hand-made tiles as part of the refurbishment and remodelling of a commercial unit at the entrance to Seven Sisters Underground Station which has lain empty for more than a decade. This technique entails colouring blocks of plain white clay with body stain and mixing together different combinations before they are sized, rolled, moulded, cut, dried, fired and glazed. The resulting tiles formed from this process will be used to clad the exterior of the building and each one will be unique. To accompany the project Art on the Underground in collaboration with A New Direction and Create Jobs hired two trainees. The two traineeships provided clay induction training, followed by hands-on making experience with artist Matthew Raw and members of Assemble. Funded by Arts Council England. ‘Diamonds and Circles’ works ‘in situ’ is the first permanent public commission in the UK by the acclaimed French artist, Daniel Buren. 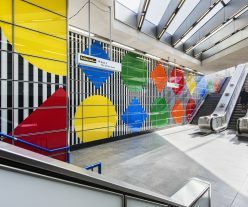 The artwork transforms Tottenham Court Road station with Buren’s signature geometric patterns across the vast central ticket hall and multiple station entrances. Buren’s designs play with simple concepts; shapes, colours and stripes. Buren has created a colourful series of large-scale diamond and circle shapes fixed to the station’s internal glass walls. 2.3m in height and diameter, the diamond and circle shapes repeat through the space. A cabinet containing the ‘parents’ of the forms in three dimensions is installed in a vitrine inside the ticket hall. ‘Diamonds and Circles’ makes us look again at the space of Tottenham Court Road station. It measures out the physical space with stripe and shape, and also asks us to consider the pace and path we take passing through the station. The work sits firmly within Buren’s illustrious practice, and yet presents the public with something wholly new. Daniel Buren is largely considered France’s greatest living artist and one of the most significant contributors to the conceptual art movement. His major public art interventions can be seen worldwide at locations including The Palais-Royal in Paris; Odaïba Bay, Tokyo and the Ministry of Labour, Berlin. 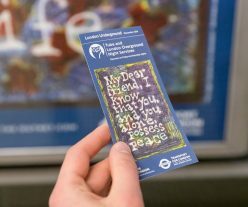 This is his first permanent public commission in the UK offering millions of Tube users and wider public a unique chance to enjoy a world-class piece of contemporary art.